There is very little to assemble on a baritone or tuba. All you have to do is place the mouthpiece into the leadpipe. Do this with a gentle twisting motion. Do not hit or pop the mouthpiece into place. This can lead to a jammed mouthpiece. Remember that the baritone is a very expensive instrument and should be handled with care. It is very important to make sure your valves are well oiled and maintained. Oil the valves once per week. Remove the valves one at a time and apply three or four drops of high quality thin oil. Replace the valve, slotting it into place or turning it until it clicks. Make sure you put the correct numbered valve back into the correct slot. All valves are labelled clearly with a number. If your baritone does not blow properly after you have oiled the valves, just check to see if you have put the valves back in correctly. Remove all slides from your baritone. Take the valves out one at a time and lay them in order on a towel. This will help you to put them back in the correct order when you have finished. Immerse the baritone body in the water along with the mouthpiece and slides. Do not put your valves in the water. Let the baritone soak for a few hours or overnight to give it a really good clean! Run your cleaning snake from your care kit through the slides and main baritone body to dislodge all the grease and gunk, then give the baritone a final rinse. Drain the bath and leave the baritone to soak upright overnight. Once the baritone is dry, re-grease the slides and re-oil the valves. Put all the slides back into place and also put the valves back into their correct positions. After playing, remove finger marks with a soft cloth. This will remove perspiration which can damage the lacquer and metal. Do not use polish on lacquered instruments because it can scratch the finish. The baritone and tuba will dent easily. Don’t stand the instrument on the floor on its bell. All too often instruments left in this position are knocked over and dented. Make sure each piece of your baritone or tube is back in the right spot before you close your case. Don’t force your case closed – if it doesn’t close properly, check how you have packed your baritone away. Do not put your book or anything else on top of your baritone or tuba as this will damage and dent the instrument. Letting your ‘water’ out: The moisture that accumulates inside the baritone or tuba is not ‘spit’. It is condensation from the player’s breath – just like the moisture from a steaming kettle that condenses on windows. When this moisture accumulates inside the baritone or tuba, it makes it gurgle and has to be released through the water key or spit valve. Open the water key and blow air (don’t buzz) into the instrument. 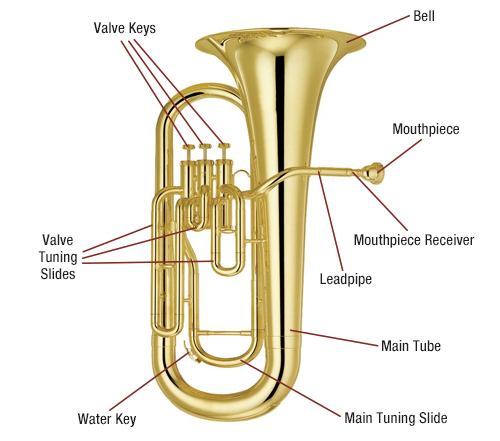 The sounds of the baritone, and its close relative the tuba, are some of the deepest sounds you will hear in an orchestra or band. The baritone’s tone is mellow and smooth, resonating deeply at the bottom of any ensemble group. You need a heroic supply of air to fill the instrument! Wagner loved the lush tone pallete of the tuba and it’s predecessor ‘The Serpent’. The tuba is featured in works by great composers such as Hector Berlioz and Modest Mussorgsky. The baritone and tuba are very special instruments.